Nick bazzano checks in with CS to supply a supreme specimen of both New York and international audible delights. Residencies and collaborations with Unter and Bossa Nova Civic Club's Wednesday masterclass Pure Immanence with cohost Kiddo Sincere. 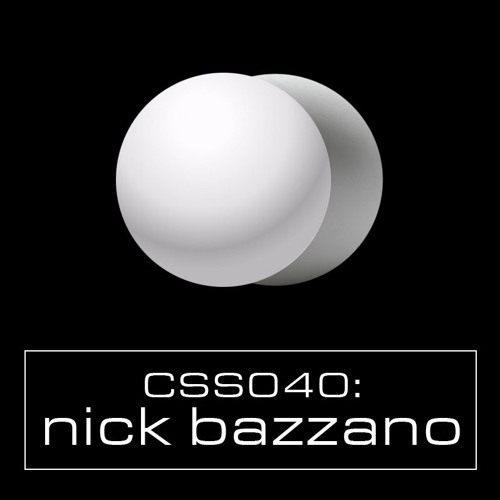 Ramping up quickly, Bazzano's work is helping keep Brooklyn a destination for techno lovers worldwide. With a mainstay at The Lot Radio's The Plan with Olga premiered with Tin Man and has gone on to feature the likes of Dr. Rubinstein and Stranger. With accolades of this caliber stacking in it's safe to say he will be delivering face melting barbed beauties for a long time to come. Nick Bazzano https://soundcloud.com/nmb2115 https://soundcloud.com/theplanradio Track List: 1. Simon Lomax "If There's Such a Thing as Nothing" 2. Nelson Sullivan "RuPaul & Lahoma Walk from Times Square to the East Village in 1986" 3. Bee Mask "Fallen Tree Thursday and the Half-Crushed Arc of the Sky Taking Tea in the Pastoral Index" 4. Modern Heads "Eurycleia" 5. Mike Parker "Invisible Arms" 6. Optics "Nimrud Lens" 7. SLV "Connections" 8. Eduardo de la Calle "Shift 003 B1" 9. Peter van Hoesen "P2me" 10. Jeroen Search "Self Aware" 11. Dino Sabatini & Luigi Tozzi "Celeno" 12. Voiski "205 Color Line" 13. Invariant Process "Strobe Field" 14. young muslim "U L T R A L O V E 慟哭 (WINTER MIX)" 15. Dean Blunt & Inga Copeland "attitude adjustment" 16. Uchi "Inc"